The following statement was written in 2007, five months before I began my journey in May 2008 across anahuc. This story begins in 1492, when the Moors had finally been expelled by the Christians from Spain. Spain decided to carry the religious expulsion Crusades to other parts of the world and seek new lands where they could exploit people for their own benefit. This greed brought them to the Americas, the land that millions of indigenous people call home. The land where their ancient ancestors also lived for thousands of years. People with names like the Maya, Inca, Toltec, Mexica, Huichol, Purepecha, Yaqui, Tarumara, Comanche, Kumeyaay and thousands of others. People with a rich history, language, culture, philosophy and science all their own. But all of this changed with the arrival of the Europeans on this continent. From that day forward the world would never be the same. Especially for native people who would be forced to endure massive death and destruction. Including my ancestors, the ones responsible for creating great civilizations here in this beautiful land we all call “America”. And endure we have!! we have endured for over 500 years. In the year 1992, people all over celebrated Columbus Day, but indigenous people from all over the continent stood up against the racist celebration of the destruction of our people. We said that was enough! Ya Basta! We were no longer going to sit by and watch as the world honored a man who represented the destruction of an entire culture. Native people organized counter protest of Columbus day celebrations. We held rally’s claiming 500 years of resistance. I participated in one of those rallies at the U.S. Mexico border and thousands of people showed up, we shut down the border for hours. We resisted and thus was born the revival of Native Resistance. Here we are in the year 2008 and the prophecy of our people coming together is becoming a reality. But we have a lot of work to do and we can’t do it sitting on our asses in front of the television, we must stand up and get out there. Build those connections with those around us or not around us to organize a resistance in your hood, city, state, country etc. The biggest tool and resource we have in our communities is…. Our Relationships. Take advantage of this and more importantly work hard to build new connections with those outside your communities. Whenever you get the chance, go out to those events and meet someone new. The world is a lot smaller than we think and it’s just a matter of time before those connections are gonna pay off. As far as my personal journey to overthrow this system and to bring our people together. I am doing this in many ways, but the biggest sacrifice i am doing toward this endeavor in 2008 is Running for Peace and Dignity. In 1992 when i first heard about the Peace and Dignity Journeys i knew that one day I would participate in this historic and spiritual run. I had no idea when and in 2004 I helped organize to support the run in San Jose, California. I decided at that time that I would try to participate fully in the next run. Well along comes 2007 and I find myself in a position to participate fully in the run. I began attending the organizing meetings in Oakland, California. 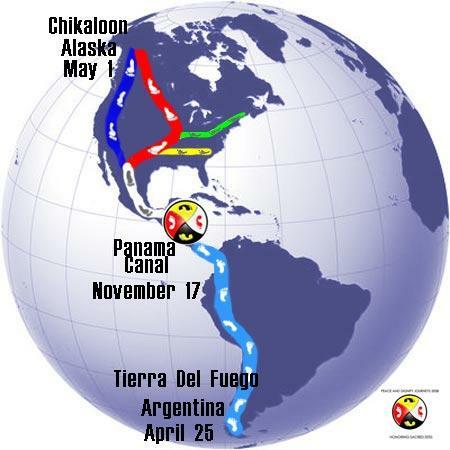 On May 1, 2008, I will begin my journey along with other native people in Chickaloon, Alaska and begin my journey south to Panama City, Panama. I plan to arrive on November 17, 2008. Part of my journey has already begun and as part of this spiritual journey I am not allowed to drink alcohol or do other drugs. In preparation for this I have to decided to stop drinking as of December 18. My goal is to bring awareness of the indigenous struggle to all my contacts and hopefully they will pass on this message to their friends. My goal is to bring healing to the First Nations and let people know that we have not left this continent and despite all of the death and destruction that the Europeans brought to our people we have not been destroyed, we continue to resist! I will struggle and resist with love in my heart. Hi. I like what you wrote. All that is required of us is to show love and live a life of peace and dignity. I pray for all of you every day.